A few years ago, I came across this idea on Pinterest. It involved using umbrellas, instead of baskets, for Easter. I love the idea because the umbrellas can be used afterward. The umbrellas (which I got from Avon) were such a hit, but the girls don't need another umbrella, so I have been scouring current Avon brochures to see what I could make up this year. This Herb Pots and Tray Set is something my girls would love. As you can see in the umbrella picture, we got them a gardening set a few years ago, so we would probably take advantage of the 3 bins and include some seeds, soil, chalk, stickers, and of course a little bit of candy. Available in Campaign 8, this ceramic "Lettuce Bowl" would make a super cute gift for my Gram, Mom, and Mother in Law. I love the idea of filling it with those shimmery Easter eggs and having it sit on the table as a centerpiece. 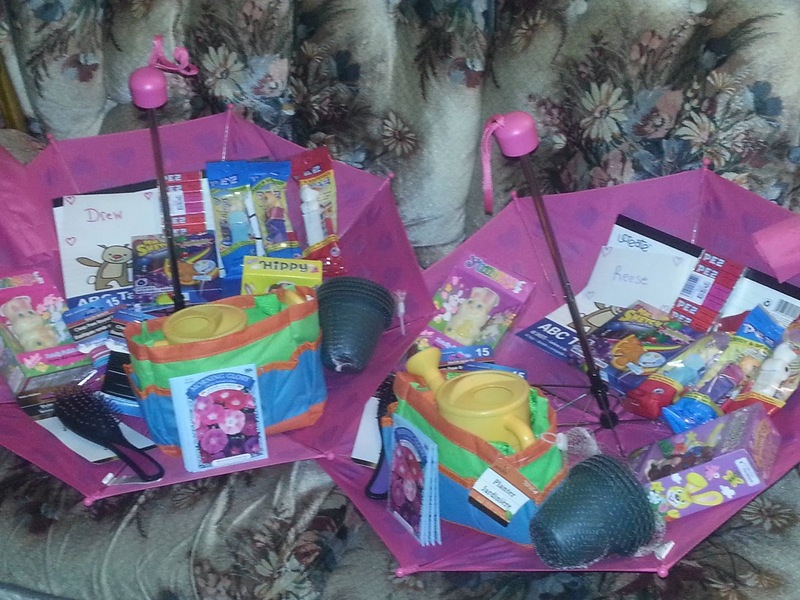 The "adult" version of the gardening bag and tool set we got for the girls. the Blooming Collection Gardening Bag with Tools comes with the rake, trowel, and planter. This is something I would give to my in-laws since they love gardening so much. I would likely pair it with a pair of kneeling pads, some seeds or maybe a small starter plant, and of course a few eggs filled with goodies. The Inspirational Bible Cover with Bookmark would be great to include in an Easter basket. I LOVE this Jeremiah 29:11 Watch and Bookmark Set. We have so many great items coming to the Campaign 8 "Avon Living" brochure that would also make great Easter basket/gift ideas. Be sure to check it out HERE starting next Wednesday! Love the umbrella idea! I might just try it instead of a raffle "basket". Thank you for the tip.